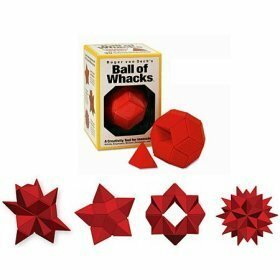 Roger von Oech's Ball of Whacks consists of thirty identical plastic pieces. 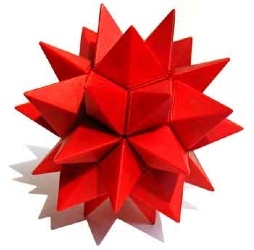 Magnets inside allow them to cling together, but also limit the geometric possibilities. Here on the left we have two sets put together, which works well, the result of a kind and indulgent grandma's giving one set to each of a pair of brothers, so that they would not have to share. Of course the two sets ended up being put together, for even more fun. Billed as a "creativity workshop in a ball", the Ball of Whacks comes with a booklet giving 96 different ideas for building. Great claims are made for the thing. It's actually not that great as a building toy, because the possibilities are somewhat limited, compared to, say, Zome or Geomag; the same limitations make it a good desk toy for an adult, if matte finished plastic suits your decor. It's pleasant to feel the magnetic pieces leap gently into place as they are placed together. You won't find nearly as many hours of play in this toy as a more open-ended building toy, but it stays neatly in place on your desk between uses. The magnets are weaker than those in Geomag and seem less likely to pose a risk to credit cards and video games. One drawback is the lack of spare parts: there are exactly enough of the identical building pieces to make the most satisfyingly symmetrical shapes, so even one missing piece is sorely felt. Every time one of my sons drops the pieces on the tile floor, as happens frequently, I cringe at the sound of what must surely be pieces shattering, but in fact we've had no breakages yet, only a couple of losses.